Garlic has been used for centuries in many different cultures to treat a variety of health issues, including the common cold. Caused by viral infection, the common cold is characterized by runny nose, sneezing, coughing, sore throat, and inflammation of the mucous membrane in the nose and throat. There are plenty of commercial cold medicines available, but their effects are minimal and short-lived, and they come with unwanted side effects. Why use those when you can prevent and treat the common cold with something as safe, simple, and effective as garlic? Want to know how it works? Let’s take a look. 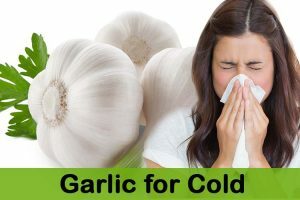 Does Garlic help to treat Cold? Yes, Garlic is naturally anti-bacterial and antiviral. It fights the germs that cause the common cold while providing your body with anti-oxidants it needs to function properly. Garlic contains Allicine, a powerful antibacterial anti-oxidant that kills the cold virus. The oil in garlic is a natural expectorant that breaks up mucus to clear congestion. For best results, consume raw, crushed garlic on a daily basis, and regularly use garlic to season your cooking. In addition to those two methods, try the recipes and home treatments to treat the common cold outlined below. Honey is anti-bacterial, anti-viral and anti-fungal which helps honey to fight against the cold. Add oil to skillet then add garlic. This process helps to cure the cold. Taking garlic supplements on a regular basis will help prevent the common cold. A study from University of Maryland Medical Center found that people who regularly took garlic supplements during cold and flu season were less likely to suffer from colds, and if they did, their symptoms subsided faster than those who were not taking garlic. Supplements are available at most pharmacies and grocery stores. Consult a doctor before starting your garlic regimen in order to determine proper dosage for your individual health needs. Although garlic is very safe and highly effective, some may experience side effects. Follow the tips below to ensure a positive experience. When taken in excessive amounts, garlic causes bad breath, body odor, indigestion, and mouth irritation. Garlic also thins the blood, so avoid taking it with other blood thinners. Garlic lowers glucose levels and increases the release of insulin, so it should not be used by those taking drugs that lower blood sugar. People who are allergic to onions, leeks, and chives may also be allergic to garlic. Use it in very small amounts at first, and if you see signs of allergic reaction, stop right away. Because garlic increases the risk of bleeding, pregnant women should not use it as a cold remedy. Over-cooking garlic may destroy its medicinal properties, so whenever possible, crush or mince it and eat it raw. Drink plenty of water while taking garlic supplements. Have you tried any of these methods for treating a common cold with garlic? Which ones worked best for you? Share your experience with us! When I feel a cold coming on, first day, do the following: take 5-6 tabs. garlic-400mg + up to 5,000 mg Vit C and lots of water every 4 – 6 hours during the day. I’m 84, a diabetic and on blood thinners but I still do this. You may get soft stools. This is the fast way to stop a cold, Stay away from Orange Juice, it works a negative effect on the body. Use Grapefruit juices diluted 50/50 with water but don’t gulp it dawn, sip it and mix with saliva – helps in digestion. If it is for cold, consumption of ACV is safe for a 2 year old kid. But make sure to reduce the quantity of it as concentrated form can cause irritation and other discomforts. Start by giving a very small dose and increase it to 1/2 tablespoon gradually. You can try 3, 7, or 9th method mentioned above in the article. Apart from treating the common cold, it also helps to improve your immunity. I love garlic and honey mixture … easy to make and I take a spoonful daily to help with whatever my body needs on daily basis morning and night.. the key is to take it on an empty stomach with fluids. .. great stuff. Could you explain the garlic socks one? Why would rubbing it on your feet help? The bottom of our feet have direct access points to the internal organs of our body. These points are called meridians as per Chinese Medicine. As we wear shoes and don’t get enough acupuncture (pressure on points) they become dormant. Once of the best ways to activate them is by rubbing garlic. The phosphorous present in garlic enters the blood stream which purifies blood and kills any flu causing germs.